How weird will Alan Wake 2 be? Very weird, according to the game's writer. Recap time: After over half a decade in development, Alan Wake was released, was excellent, didn't sell that well, but was still in the running for a potential sequel. While no sequel has been confirmed, however, writer Mikko Rautalahti thinks that Alan has more stories to tell. 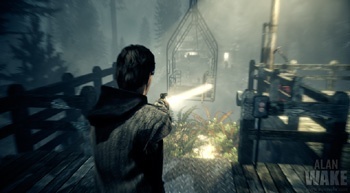 "There will be more Alan Wake, if we have anything to say about it," he told Xbox 360 World. "It's a bigger story than just one game, and we want to make it very weird and scary and wonderful." That's not to say that Rautalahti thinks that the first game was an incomplete story, though. "I'd like to say that if our offices were wiped off the face of the Earth and all you got was that first game it would work just fine as a standalone product ... I know some people don't see it that way but it's not intended as a huge cliffhanger, it's an ending to that story." And yet, the Remedy team knows exactly what next challenges the beleaguered writer will be facing next, should a sequel get greenlit despite the first game's lukewarm sales. "We have a very definite story arc and the weird and horrible things that happen to him, and what he needs to do in the end to put things right."